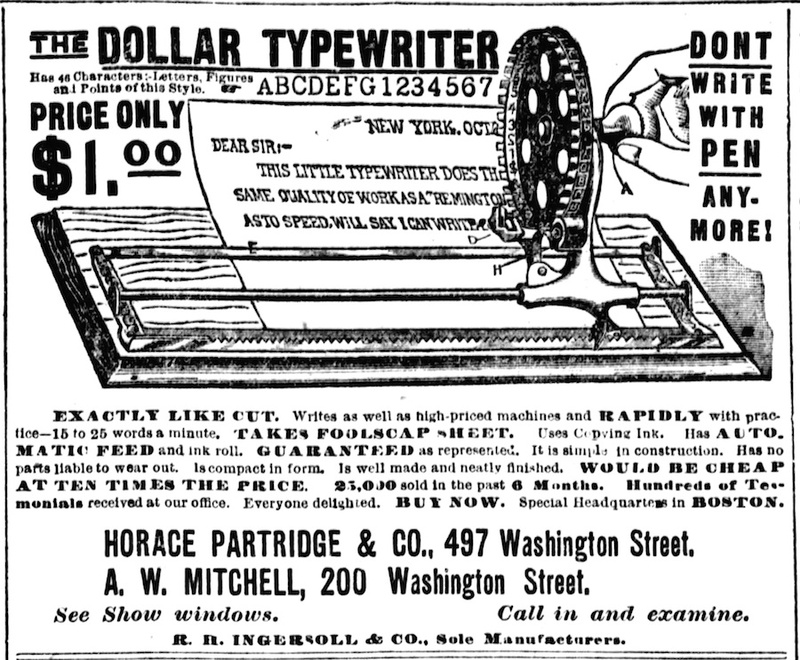 A Dollar Typewriter. From Chuck & Rich’s Antique Typewriter website and museum . In 1893 the Dollar sold for as little as 25 cents. In 1897 the Yankee for as little as 65 cents. In 2015 a Yankee garnered $2,500 on eBay! (See previous story here.) 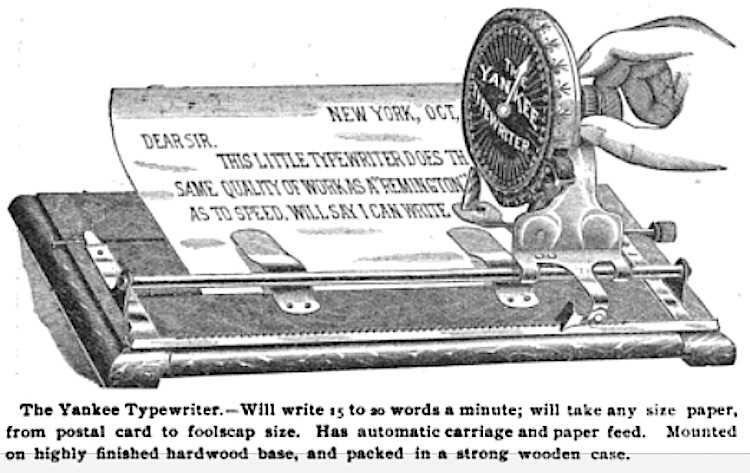 Invented by Robert Hawley Ingersoll, these index typewriters are exceedingly rare today. 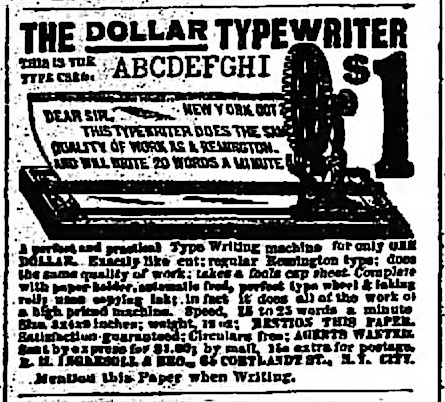 In The Typewriter Sketchbook, Paul Roberts was not sure which came first, but, now, thanks to increased access to digital archives, it appears the Dollar preceded the Yankee. 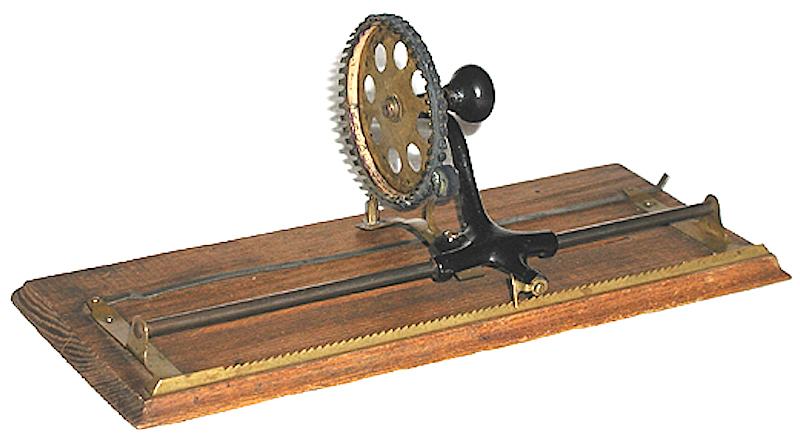 Robert Messenger tells the story of the machines’ inventor here, but advertisements also tell a story. It seems each was offered as a serious machine, but then later as a toy. From The Iola Register (Iola, Kansas) Feb. 13, 1891. From The Weekly Wisconsin (Milwaukee, Wisconsin) April 11, 1891. From the Boston Post, April 29, 1891. From The Standard Money Manual: Moneys of America, England, Ireland, Scotland, France, Germany, and Spain, 1892. Click image to visit Google books. Once competing against $100 Remingtons, now a 25 cent toy. From the New-York Tribune, Dec. 17, 1893. Now the Yankee, once again competing with Remington — “most instructive and amusing for the young folks and practical for business work.” From The World (New York, New York) Dec. 11, 1897. One of Ingersoll’s one-dollar novelties. From The World (New York, New York) Dec. 19, 1897. Child’s play. From The Courier-Journal (Louisville, Kentucky) Dec. 19, 1897. The last advertisement for the Yankee (that I could find) appears in 1898. From Hardware, see here. Previous post: Yankee Doodle Dandy!